Before you freak out and automatically assume you cannot possibly make this delicious bounty of all-American greatness, just hear me out. I am not an awesome pie-maker. It’s one of the things I kinda steer clear from because I know how much “technique” is involved, and its so easy to screw up despite how seemingly simple it is…right? 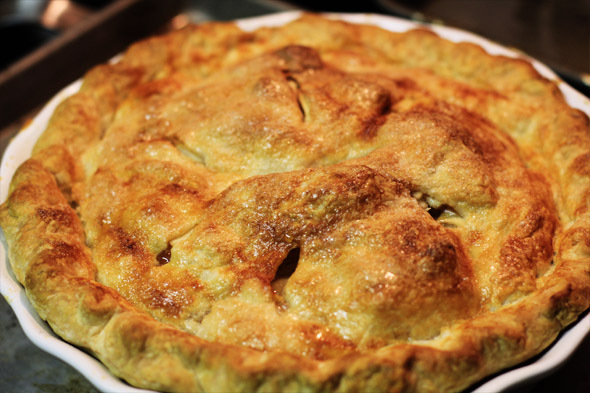 The last time I attempted to make an apple pie was in 2002, and it wasn’t that great. 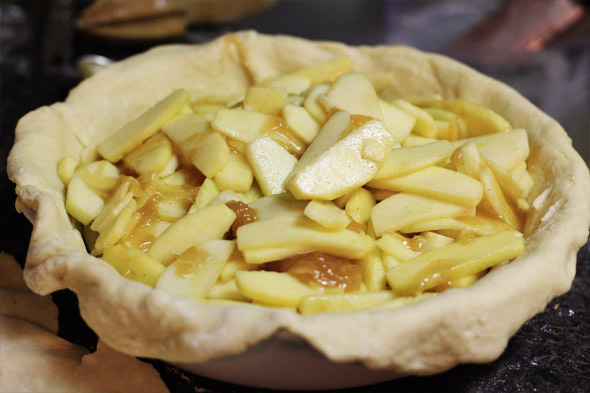 The crust was decent, the overall flavor was great, but the apple filling turned into a swimming pool. There was exuded apple juice everywhere, rendering the pie damn near inedible. I had to pour out at least a cup of deliciously sweet, cinnamon’y apple juices so that it wouldn’t leave the rest of my pie soggy. All in all, it was a disaster. I figured I’d just leave apple pies alone and leave it to the pros. But I’m not one to give up — I may postpone an effort for a while, but I won’t totally write it off until I nail it. I’m resilient like that lol. 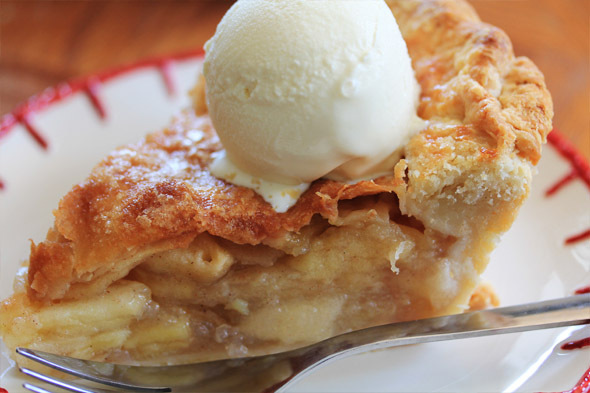 After gazing at many, many soggy apple pie solutions, I finally found the one that is fool-proof enough for me. My apple pie fear is no longer an issue. I can do this, and I can do it well. 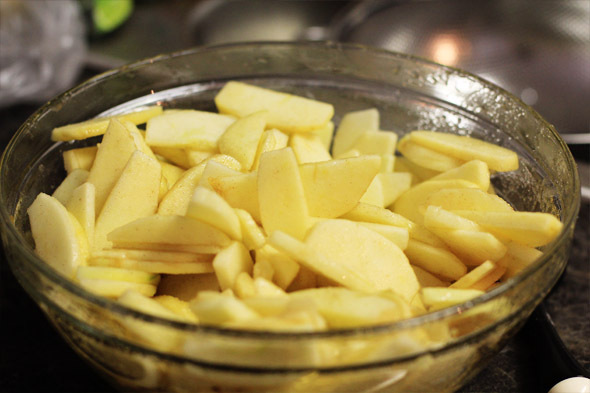 To prevent the apples from turning into a jacuzzi, you’re going to toss the freshly cut apple slices with the sugar and spice and allow it to drain for at least a half hour — I let mine drain for about 35 minutes. What happens here is that the sugar draws out excess moisture from the apples. Then you’re left with about a cup of juice. Then, we reduce that juice down in the microwave to about a half cup. 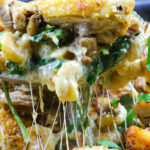 It turns into a concentrated apple syrup full of flavor, and when it’s added back to the apples just before baking, you get all of the flavor but none of the soupy wetness. 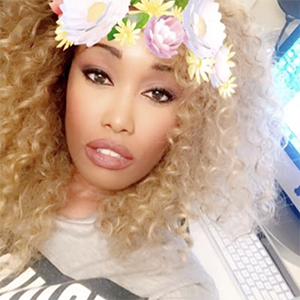 You’re probably saying, “Ok, Resha, that’s nice and all, but it’s the dough I have the most trouble with!”. Hey, I’ve been there! I know your fears, I know how apprehensive you might be feeling right now — but please remember that anything I can do, you can do. I’m not trained, I never took a cooking class in my life. 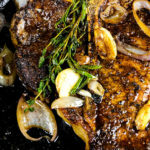 But I apply as much common sense to my cooking as possible, and even if something fails I will immediately know why and how to prevent it from happening the next time. This dough is dumb easy to do. You should avoid over-thinking the process, because that will stress you out and probably give you terrible results (I speak from experience). I will try my best to hold your hand thru this process and explain things as clearly as I can. This is an all-butter crust. The most important thing here is to keep your fats cold, and don’t handle the dough too much because we don’t want the butter in the dough to melt. Why? Well butter has water in it, and when that water is evaporated inside of the dough during the baking process, you are left with buttery flakiness. 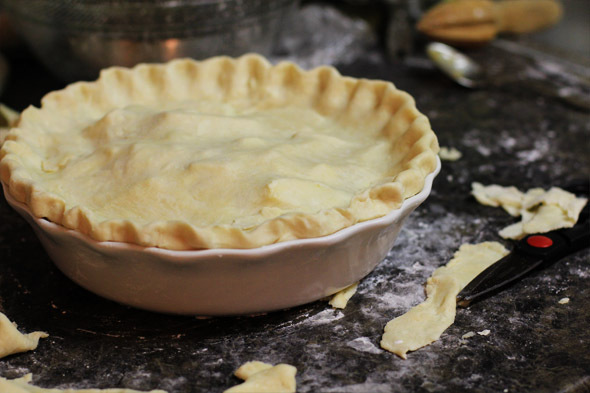 If the butter is melted or softened too much during the handling process, flakiness isn’t gonna happen, and you’re going to be left with flat, tough, less than stellar pie dough. We also don’t want to over-handle the dough because too much gluten will form and leave you with a tough, leathery pie dough. By adding a little sour cream to the dough, we keep the buttery flavor , tenderness, and minimize gluten formation. 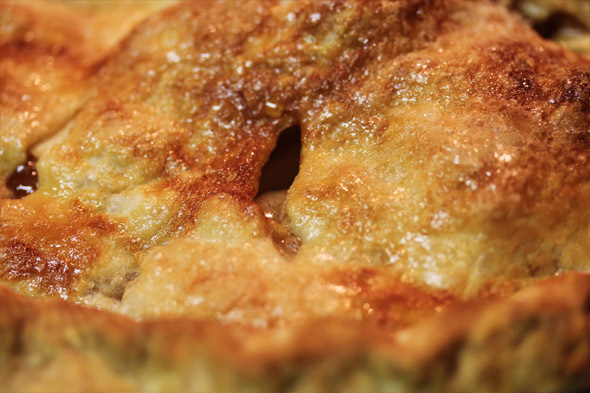 This pie dough bakes up flaky, crusty, and incredibly delicious. The apple filling isn’t mushy and soggy at all either — the apples still have bite to them and everything holds up beautifully. 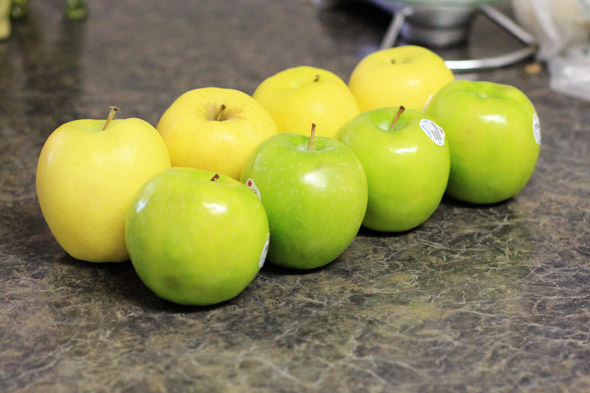 Well, you my find that the Golden Delicious apples get a little softer than the Granny Smith’s, but they’re still able to hold up so you make clean slices. I recommend baking this baby in a Pyrex pie dish for even doneness. I clearly didn’t bake mine in my Pyrex because it was at my mom’s house and I honestly didn’t feel like going over there when I had another pie dish to use. While my pie was delicious, it would have been a perfect 10 had I used my Pyrex to evenly brown the bottom of the pie. 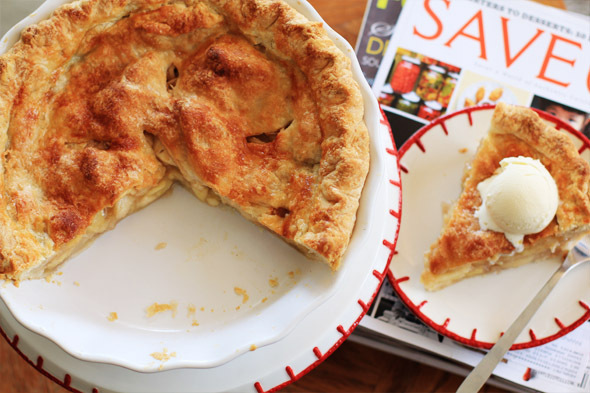 If you don’t have a Pyrex pie dish, you can grab one anywhere for about $10 or less. 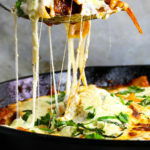 They truly conduct the best heat for this recipe. All in all, this is a great recipe that I intend on keeping forever for the simple fact it’s hard for me to screw up lol. So, are you ready to make pie? Of course you are. Let’s get started! 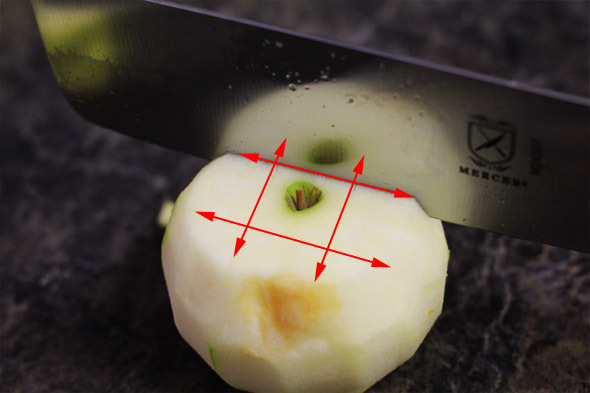 Peel the apples, chop off the tops and bottoms, then core them with an apple-corer, or square off the core with a knife like I did here. This is what we’re not using. 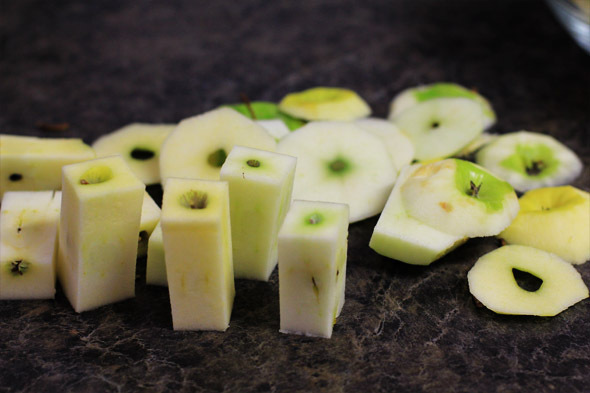 Slice the apples like I did here, or cut them into even sized chunks. It’s totally up to you. Add the cinnamon, sugar, allspice, lemon juice and a tiny pinch of salt (helps bring out the flavors). Transfer apple mixture to a colander, or strainer over a bowl and allow the juices from the apple to drip down for a good half hour. This helps draw out excess moisture so we avoid having a soupy apple pie. While this hangs out, let’s make the pie dough. 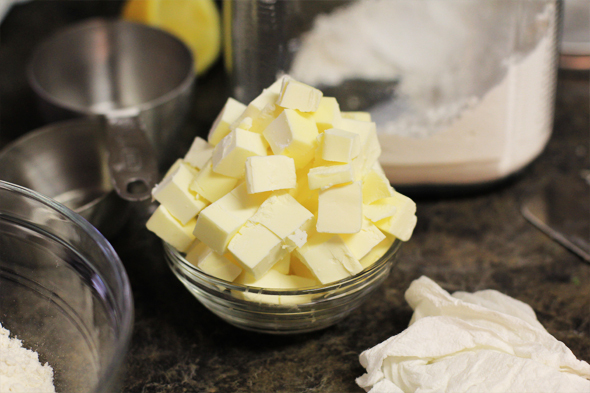 Take your unsalted butter out of the fridge, then chop it up into diced cubes. Keep it cold while you gather the rest of your ingredients for the dough. 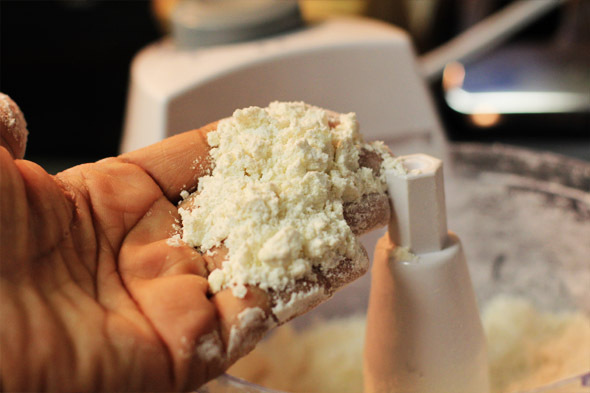 Once you get all of your other ingredients together for the dough, it’s time to mix it in the food processor. 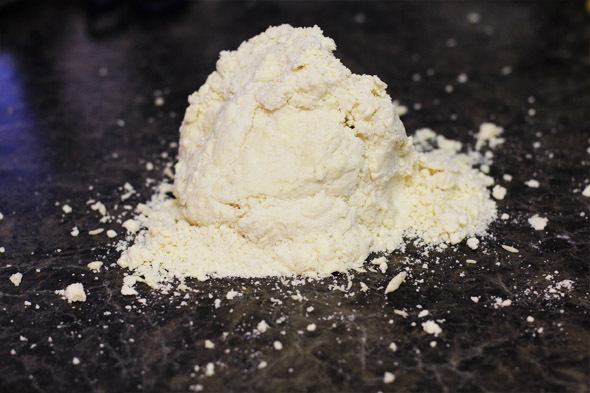 Pulse a few times until the cold butter is combined in the flour and looks like sand. The butter should be about the size of a pea, like you see here. Then add your water/sour cream mixture and pulse until the dough comes together, be careful not to overprocess. And here’s the dough. It shouldn’t be completely soaked, and it shouldn’t be any dustier than this. You cant tell from this photo, but its perfect. My old food processor sucked, so it didn’t get all of the flour bits in the corner but once I clumped it all together, it was just right. A nice clump’able mound, and moist enough to work with and press together. It’s about the same texture as Play-doh. 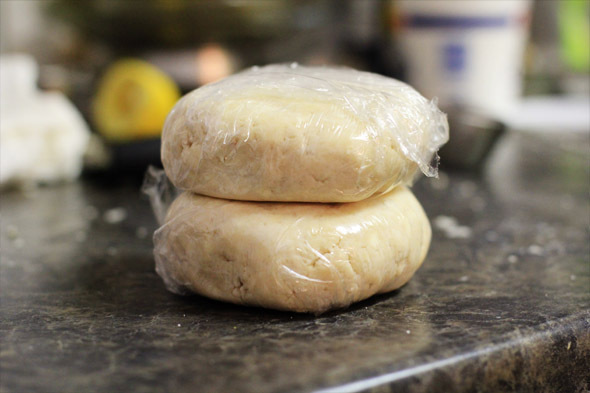 Press the dough into a mound and divide into two even balls. Wrap tightly with saran wrap, and throw it in the fridge while the apples do their thing. This dough can be made 2 days in advance. 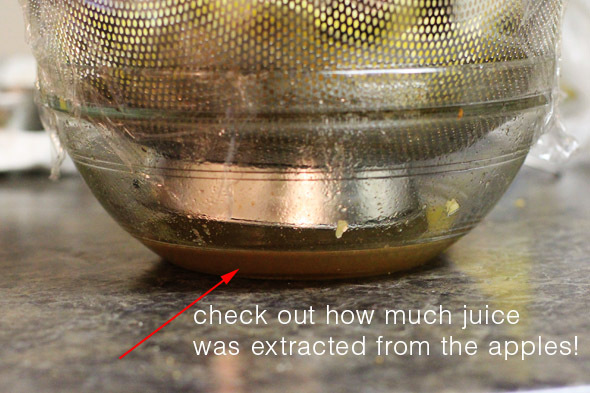 After about 35 minutes or so, look at all of the extracted juice from the apples! That would have ended up in our pie, and that’s no bueno. Pour the juice into a microwave safe measuring glass (alternately, you could do this on the stove over medium high heat), and zap it on high until it’s reduced by about half. Should take between 5 to 10 minutes depending on the strength of your microwave. Like this. 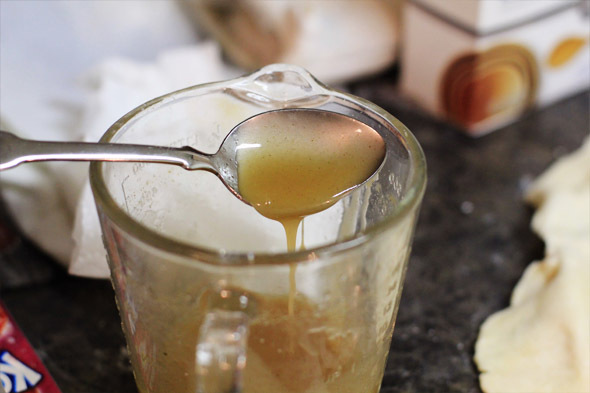 The liquid becomes very syrupy and thick, which is perfect. You should have about 1/3 cup of apple “syrup”. I had 1/2 here, but I reduced it down even more til I had about 1/3 cup. This is the consistency. This stuff is full of flavor and very low on excess moisture. 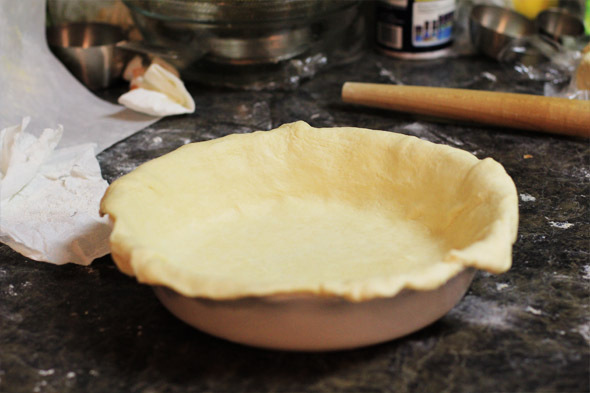 Take your pie dough out and roll it wide enough to fit both the top and bottom of your pie dish. I recommend using a Pyrex pie dish instead of the kind Im using here. 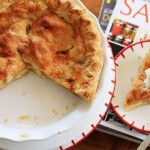 A Pyrex pie dish will give you a better looking bottom crust as well as top. If at any time your dough gets a little too warm, put it back in the fridge for a few minutes to firm up. 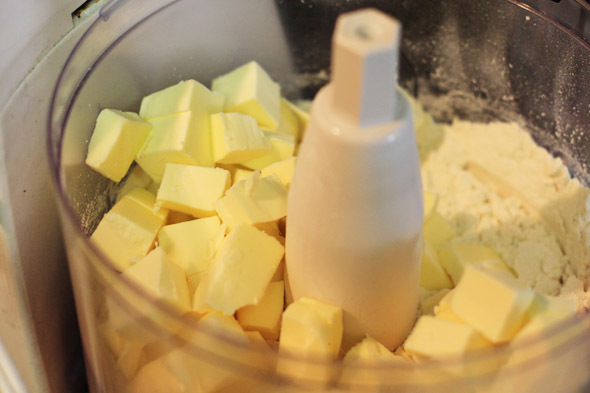 Do whatever you can to prevent the butter in the dough from softening too much, or melting. Here are your drained apples. 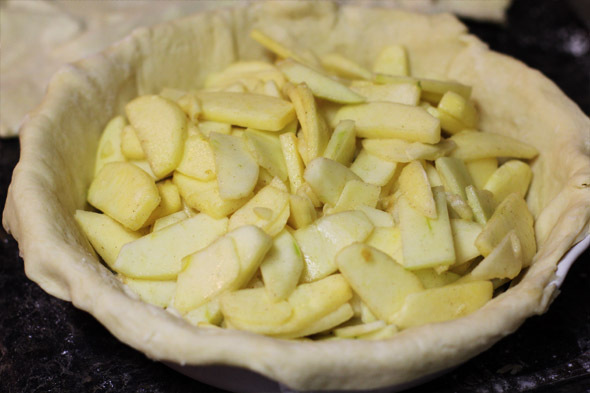 Before we add them to the pie dish, toss them with about 1 to 2 tablespoons of corn starch until they’re evenly coated. Add the apples to the dish. Pour your concentrated apple “syrup” over the apples. It will almost immediately harden when you do this, don’t worry. It’s just the warm liquid hitting the cool apples turning into a candy almost. It will melt again once it’s in the oven. Fit your top layer of dough over the dish. Pinch and flute the edges with either your fingers, or use a fork. Brush the top layer with egg wash, and sprinkle with granulated sugar – evenly! 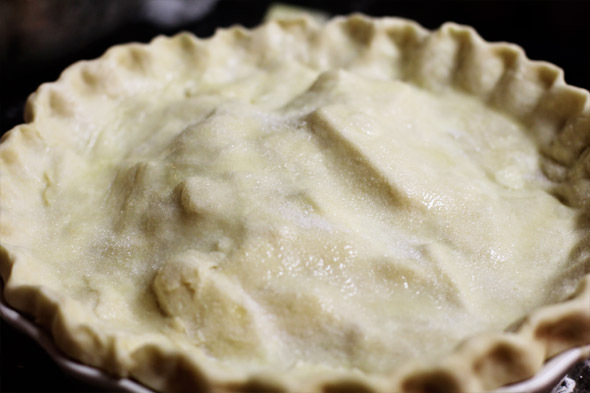 Cut a few slits into the top of the pie to allow steam to escape. 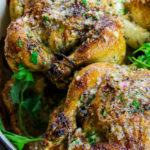 Bake this baby on a preheated baking sheet and watch the magic happen. Do you see how the butter in the dough is causing the crust to expand? Those are going to give us super flaky layers. The reason we preheat the baking sheet is so the bottom of the pie dough cooks and browns evenly. It’s also extra insurance in case any pie juices bubble over and burn on your oven floor. All done. 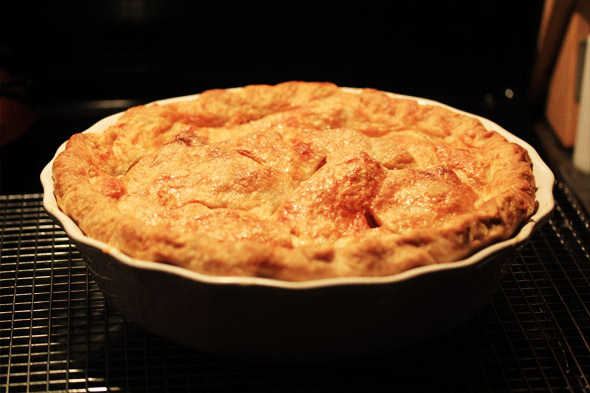 The apple pie will cool and settle. I let the pie cool COMPLETELY before I cut into it. Longest few hours of my life, but worth it — because look at these even, clean slices. Process flour, salt, and sugar together in food processor until combined, about 3 seconds. Add butter and pulse until butter is size of large peas, about ten 1-second pulses. Using fork, mix sour cream and 1/3 cup ice water in small bowl until combined. Add half of sour cream mixture to flour mixture; pulse for three 1-second pulses. Repeat with remaining sour cream mixture. 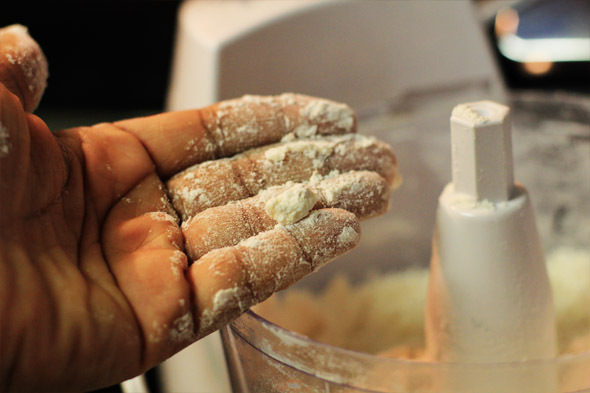 Pinch dough with fingers; if dough is floury, dry, and does not hold together, add 1 to 2 tablespoons ice water and process until dough forms large clumps and no dry flour remains, three to five 1-second pulses. Dough should feel a little like Play-doh, as a reference. Place empty rimmed baking sheet on the lowest oven rack, and heat oven to 425 degrees. 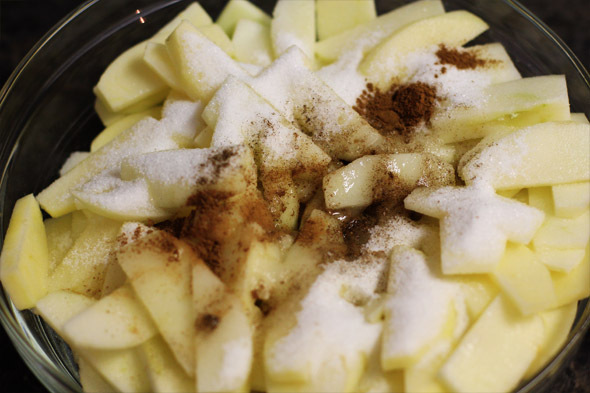 Peel, core, and cut apples into 1/2-to-3/4-inch slices and toss with 3/4 cup sugar, lemon juice, allspice, cinnamon and pinch of salt. Toss apple mixture together until evenly coated. 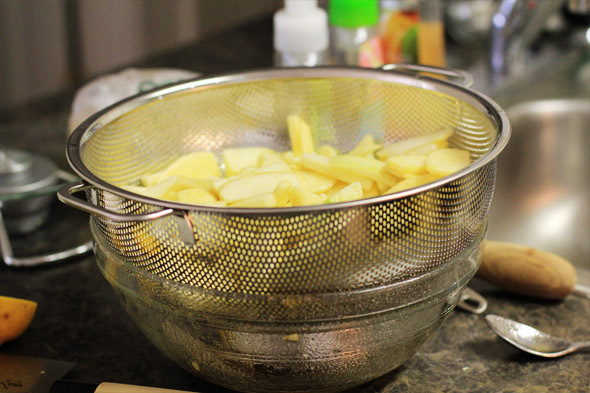 Transfer apples to a colander or strainer, over a large bowl and allow the apple liquid to drain for at least 30 minutes. You should be left with about 1 cup of juice. 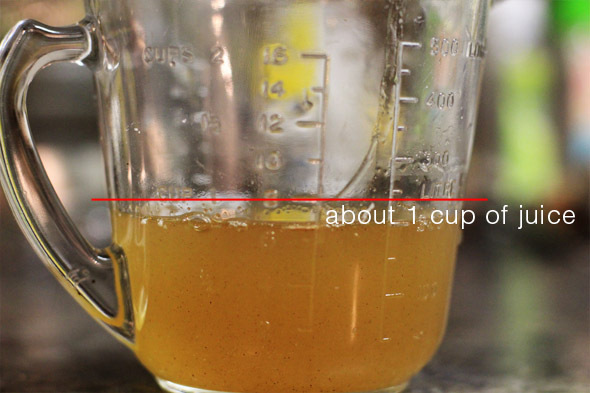 Pour the leftover apple liquid into a microwave-safe glass measuring cup or bowl, and microwave on High until the liquid has reduced by about half. 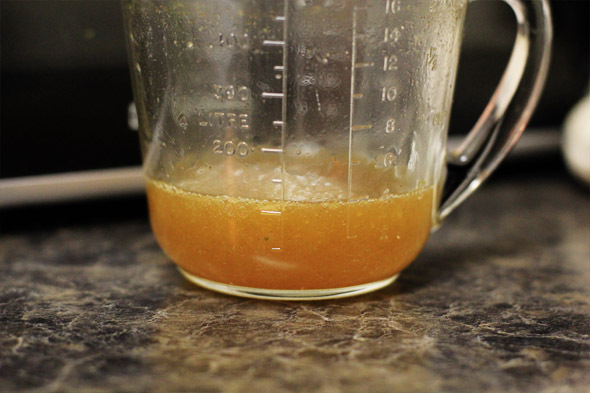 You should have about 1/3 cup of reduced apple liquid. Set aside while you prepare the rest of the pie. Remove 1 disk of dough from refrigerator and roll out between 2 large sheets of parchment paper or plastic wrap to 12-inch circle, about 1/8 inch thick. (If dough becomes soft and/or sticky, return to refrigerator until firm.) Remove parchment from one side of dough and flip onto 9-inch pie plate; peel off second layer of parchment. Working around circumference, ease dough into plate by gently lifting edge of dough with one hand while pressing into plate bottom with other hand. Leave dough that overhangs plate in place; refrigerate until dough is firm, about 15 minutes. Meanwhile, roll second disk of dough between 2 large sheets of parchment paper or plastic wrap to 12-inch circle, about 1/8 inch thick. Refrigerate, leaving dough between parchment sheets, until firm, about 15 minutes. 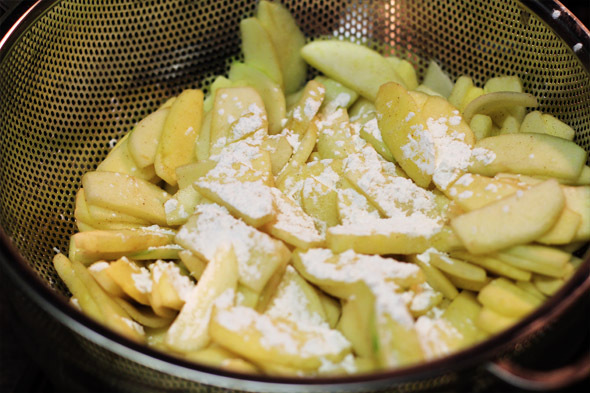 Toss the apples evenly with 1 to 2 tablespoons of cornstarch. 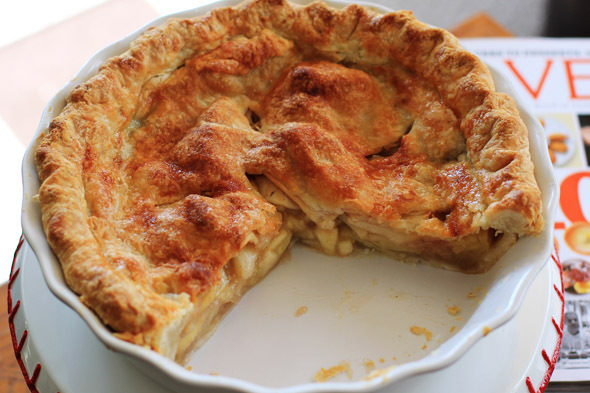 Fill the bottom portion of the pie with the apple mixture, and drizzle the reduced apple liquid all over the filling; it will almost immediately harden, but don’t worry. It will melt again once it’s baked. 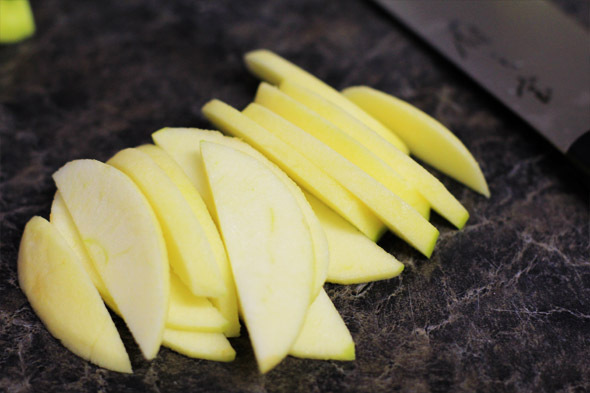 Remove parchment from one side of remaining dough and flip dough onto apples; peel off second piece of parchment. Pinch edges of top and bottom dough rounds firmly together. Trim excess dough with kitchen shears, leaving 3/4-inch overhang. 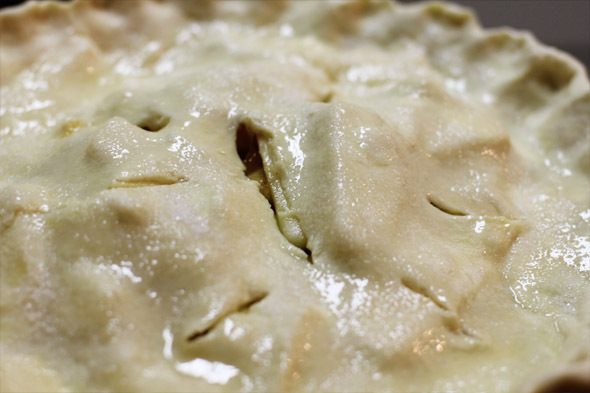 Fold dough under itself so that edge of fold is flush with outer rim of pie plate. To seal pie, flute edges using thumb and forefinger or press with fork. Brush surface with beaten egg white and sprinkle evenly with remaining teaspoon sugar. 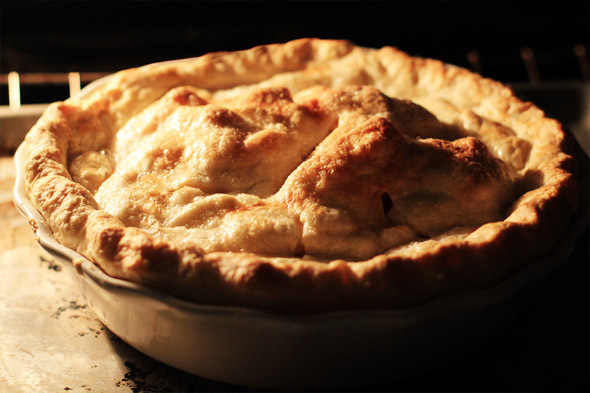 Set pie on preheated baking sheet; bake until crust is a deep golden brown, 40 to 55 minutes. Transfer pie to wire rack and cool at least 2 to 3 hours before cutting into it. Just made this. It’s 12:12am so I figure I’ll try some in the morning. It smells pretty damn good though. The first try was so-so, but the second round was AWESOME! This was so yummy! Thank you…and HE says thank you as well! Nice! Glad to see you kept going until it was great 🙂 That’s what I love to hear. 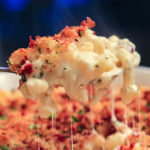 Dying to make this recipe this weekend but I don’t have a food processor. Can I use a blender on pulse? I was just about to ask this question! 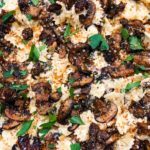 I do not own a food processor either, but I want to try this recipe for Thanksgiving!